For companies mixing in-house, temperature and humidity are two variables most difficult to control all year long — yet they’re two variables that greatly affect viscosity, pot life, adhesive performance, and cured properties. When the environmental temperature is warmer, a two-part resin and hardener system will be lower in viscosity when mixing, and will react faster. Filled adhesives, such as electrically or thermally conductive systems, may show increased settling and require extra processing steps. As the reaction takes place, you’ll see a noticeable change in flow properties: the adhesive may not behave the way it would normally. The adhesive may flow too much initially or it may not flow enough if the reaction causes it to thicken faster than usual. When the environmental temperature is colder, the resin and hardener will be harder to mix due to the adhesive’s higher viscosity. In addition, the adhesive may not wet the surface of your substrate and bond strength will suffer. Some resins and hardeners will crystallize at lower temperatures as well. If not de-crystallized properly, the adhesive will be clumpy and won’t fully react; bond thickness and adhesive performance may be affected. Humidity is a factor caused by increased moisture in the air. The problem here is that certain curing agents will film or skin over when exposed to humidity. 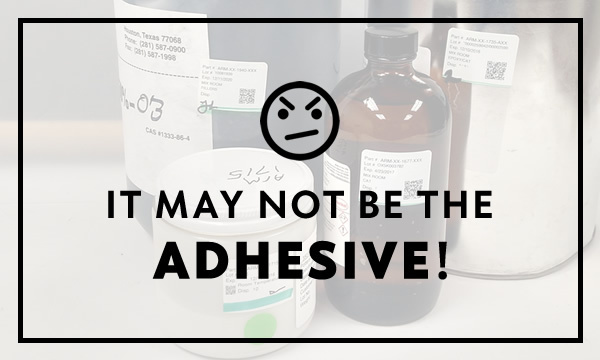 If your cured adhesive is softer or more foamy, it may be a tell-tale sign your adhesive has been contaminated with moisture. Unfortunately, re-blending moisture contaminated material isn’t an option; you have to dispose of the material and start over. To prevent moisture contamination, you would need to blanket the material with a dry inert gas, typically a nitrogen purge. It’s important to do this after every use. Engineers rely on Appli-Tec and our packaged PMF adhesives because when a part fails, they know it’s not the adhesive. Appli-Tec conducts incoming inspection, including FTIR validation, of each adhesive before its use. Our mixing environment is temperature and humidity controlled, and mixing is performed to a documented procedure with every lot number, quantity and time recorded. It’s why you get consistent results, every single time. Greg Duhamel is the Engineering Lead for Appli-Tec and a chemist with 25 years experience in the adhesive industry. Data driven, he works to standardize manufacturing processes and procedures to ensure consistent product conformity.